Book Review: Smash! By Ian Winwood - GENRE IS DEAD! When you think about 90s rock music one genre jumps to mind: grunge. Though it didn’t last long, it still left an impact big enough to overshadow other music trends of the era, specifically punk rock. 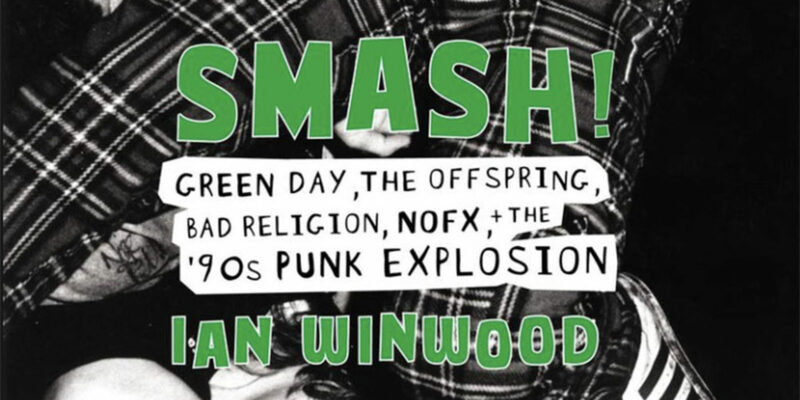 Ian Winwood looks at the oft-forgotten 90s punk revival in his new book, Smash! He studies the rise of the genre while talking about specifically about NOFX, The Offspring, Green Day and Bad Religion. Along the way, he also highlights other key players of the movement, such as Social Distortion, Rancid, and Lawrence Livermore and how they helped keep punk rock alive. Featuring new interviews with the aforementioned bands, Winwood gives us a side of punk rock that’s not often discussed. Usually, punk in the 90s is a footnote compared to its rise and fall in the 70s and 80s. And while he briefly talks about those eras, he pays special attention to how the genre gained popularity in the age of grunge and Nirvana. It’s not a complete history of the punk era. Rather it’s a history of those who made the biggest impact, like Green Day and Bad Religion, and how they brought punk to the masses. Yet, it’s his focus on The Offspring and NOFX that’s most notable. Everyone knows the stories of Green Day and Bad Religion finding mainstream success. They’re the first ones you think of when it comes to 90s punk. But as Winwood points out, The Offspring and NOFX helped shape punk during this time. Problem is they’re usually overshadowed by the behemoth that is Dookie. It’s easy to forget there was a time when The Offspring were so hot they were approached by Madonna’s Maverick Records or how NOFX’s Punk in Drublic went gold without any radio play. He also gives credit to bands like Social Distortion and Rancid who weren’t as well known, but still played a major role. It’s pleasure reading about these bands that most publications try to write off as relics of the era. And you’ll gain a new appreciation for them. They are truly the underdogs here, but the real heroes of the story are Green Day and Epitaph Records. At its core, the book is the history of Epitaph Records. Winwood writes about Bad Religion’s history and the impact they had in keeping punk alive when it was on its way out. But it’s his study of guitarist Brett Gurewitz’s label Epitaph Records that stands out. It’s easy to forget what a major influence they had on the scene. It’s one of the few independent labels that found slow, yet steady success during this time. It not only gave punk bands a place to call home where they knew they would be supported, it’s also responsible for bringing the bands Winwood studies to the forefront, with the exception of Green Day, though the trio was approached by them. He even closes the book saying without Epitaph we wouldn’t have these important bands. But no discussion of punk in 90s would be complete without mentioning Green Day. Green Day’s well-known tale of three bratty punks clawing their way to mainstream success is recounted here. Winwood hits all their highs and lows, such as their controversial move to a major label, their ban from 924 Gilman Street, their near demise, and their epic comeback with 2004’s American Idiot. Well versed fans already know these stories, but new interviews from Billie Joe Armstrong, Tre Cool, and Mike Dirnt add additional insight into their history, such as the anger, frustration, and rebellion that culminated in their 1995 album Insomniac. It’s a story we may already know, but it’s still entertaining to revisit the beginnings of one of rock’s biggest bands. Unfortunately, the book ends on a rushed note. Winwood speeds forward to 2004 to talk about Green Day’s American Idiot when the previous chapter examined the events of 1995. He spends a few brief moments talking about the band’s other releases and to check in with The Offspring, but the final chapter is mainly about Green Day’s major comeback. There’s no doubting the album’s importance and its significance in the story, but it’s a disappointing ending. Bands that were discussed in previous chapters have practically been erased from the story at this point. Green Day’s story is important, but with how big the band is, there are countless publications covering American Idiot‘s success. It’s a shame that the other featured bands are forgotten by this point. Despite this, Smash! is a loving homage to a forgotten era of punk. Winwood’s focus on punk in the 90s opens a new chapter on the tale that most don’t talk about. It’s not only an exciting read for music and punk fans alike, but he also shines a light on bands that don’t get enough credit. At the same time, he doesn’t shun the well-known acts who played a major role. It’s not only a story about the bands, but it’s also a story about how punk rock rose from the ashes to conquer once again.